Rather than eat all of the candy myself (what exactly do you do with all of the candy you get at Easter?? 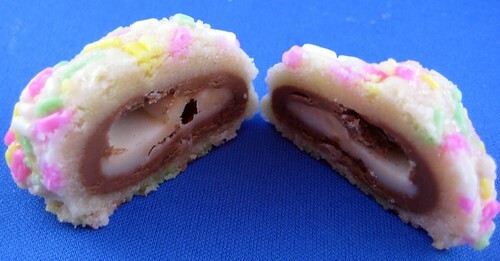 ), I decided to give some away and incorporate the mini Cadbury Creme Eggs into some sort of cookie. A quick Google search led me to some rather strange recipes, but I finally came across this sugar cookie one. The cookie itself is pretty plain, but combined with the sprinkles or sanding sugar and mini egg in the center, it’s perfectly sweet. I had some issues with the fondant part of the egg melting (resulting in runny eggs, hah), but I have a feeling this could be alleviated by freezing the eggs before wrapping the dough around them. I also made some cookies using Reese’s mini eggs and those stayed completely intact. Add salt and flour, mixing until well combined and soft dough is formed (if the dough is too sticky, add a little more flour). Roll a tablespoon of dough into a ball and flatten it with your fingers. Place an egg in the center of your dough and gently press the remaining dough around the egg until it’s completely covered. Lightly roll in the palm of your hand to cover smoothly then roll in sprinkles and place on baking sheet. Repeat until all your eggs have been covered then place in fridge to chill for about 30 minutes. With about 10 minutes left, preheat your oven to 350. Place cookies in oven for about 10-12 minutes; the cookies won’t brown so gently press into one to feel for doneness. Recipe adapted from swEEts by e.